4.11.2008 - I am the best. The best there ever was or ever will be. At removing dead animals from homes. That's it though, I'm not the best at anything else. This here job wurn't too tough, but it were tough enough that neither the homeowner or the first company they called couldn't git er done. I got her done in one minute, forty two seconds. The house smelled horrible. I stepped inside and I knew it was a dead opossum. Dead possums smell different from dead rats, cats, bats, or shower mats. My nose led me right to the air vents - a rare source for the odor, but I could tell. I could tell which air ducts smelled worse than the others, such that when I went under the house and to the ducts, I could see before me exactly where the carcass must lie. I wasted no time crawling my way to the spot, I popped open the duct, took a photo, removed the dead animal, tossed the camera to my pal, and he took a photo of me, and after the decon spray I was out of there. I'm the fastest and the best. 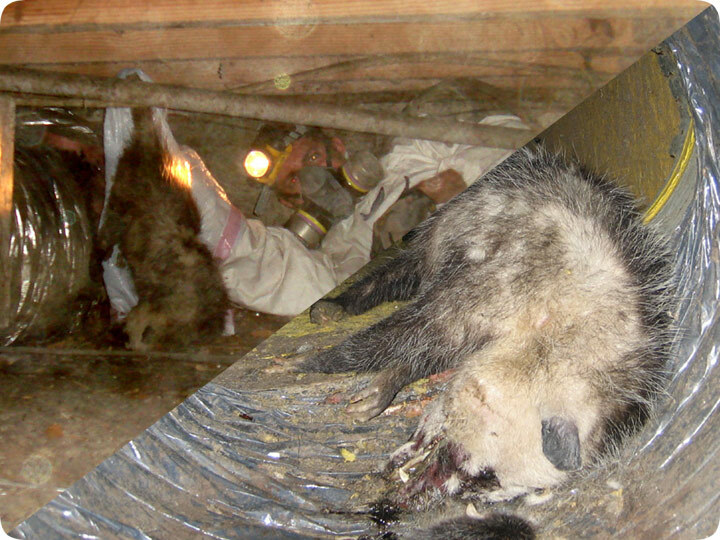 Statistically, only 1/10 of dead animals in ducts are ever successfully extracted. I extract 10/10 100% of the time, and I rate a 10/10 on the DARE (Dead Animal Removal Excellence) scale. If you need dead animal carcass removal, give me a call, and I will do it with a smile on my face and gladness in my heart. Do it yourself: Visit my How To Get Rid of Dead Animals page for tips and advice. How to get a dead animal under the house - There is only one way to get a dead animal under the house: You have to go under the house and get it. Unfortunately, there is only one thing that will eliminate the odor of a dead animal aside from finding it and removing it from the area. If you can?t manage to climb under your home, you are going to have to wait for the decomposition process to complete. Depending on the size of the critter, this process can take months. Leaving a carcass under your home is risky business. Not only will the smell bother you, it will draw in other animals that feed on carrion. There are different nuisance animals out there that can cause issues, and the last thing you want is to have them snooping under your home looking for dinner. Even if you don?t have the heart to slide into the darkness under your home, many wildlife companies offer this as an additional service. The fee will be nothing compared to the relief you?ll have from the fetid odor. It?s either hire a professional or hire the neighbor boy, though the latter might be more entertaining.